There's nothing quite like the most lovely parcel of goodies dropping through your letter box to cheer you up for the rest of the day, or even the week! This week a bundle of loveliness came from the ever so talented Mitsy of ArtMind - with one or two extras from both her and the equally lovely Anna of Lila Ruby King, but more about that in a bit. Over the last few weeks I've been browsing Etsy armed with some Christmas pennies and mostly I've been quite indecisive as to what to buy. That was until I popped into Mitsy's wee shop and saw these two wee singing birds. They are actually inspired by Anna's tiny bird inspired artwork, so as I am a massive fan of both these lovely ladies I just had to have them! Who made themselves at home in an instant and took upon the job as guardians of my newly organised yarn stash! It makes me smile and helps me sleep well at night knowing my yarn is safe thanks to these lovely ladies! So as I said there were a few extras in my wee parcel, these lovely ladies were one of them along with a set of postcards from both Mitsy and Anna. They were my prize for getting second place in a competition over on Mitsy's blog. The idea of the competition was to guess who she was working with as part of her 'secret project', luckily I guessed it was Anna and her jewelry designs and honestly this collaboration is a match made in heaven. 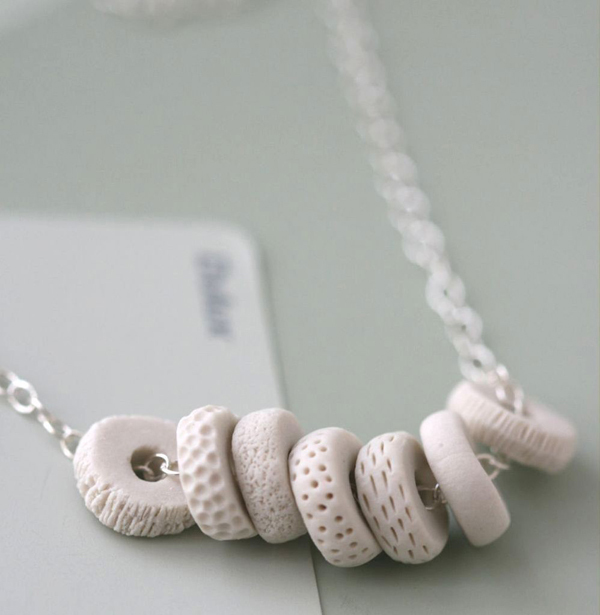 Misty has made the most delicately textured porcelain beads and pebbles for Anna to use in her designs, which are just beautiful! The first time I saw these I was completely mesmerised! I adore the Loop Necklace but I must say my favourite has to be this brooch, Formation No 1. You can see the rest of the range here, in Anna's jewelry shop. I'm guessing that there will be more designs yet to come as the infamous Barbie hands are yet to make an appearance, I so can't wait to see what is made from these! Oh wow, what a superlovely post this is, Emma! 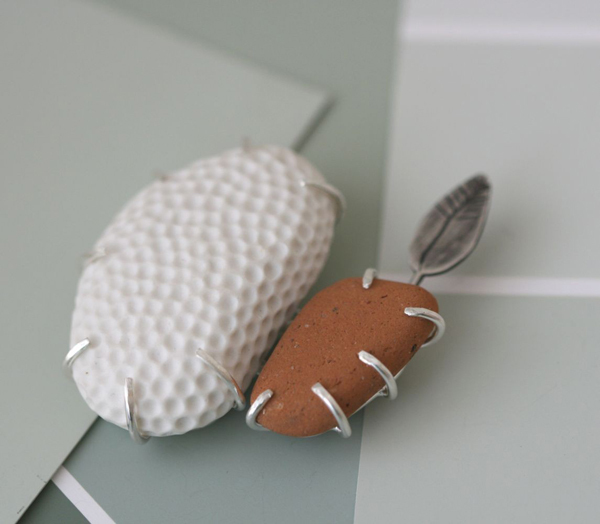 Thanks so much for loving the birdies and all the other goodies! Those 'happy girls' are fab. They look so good among the wool stash. Hi Emma, what a wonderful post! what gorgeous pictures, the colourful girls look so wonderful hanging by your yarn! I'm so happy you like our new work, and congrats again for getting second place!! Those porcelain beads are most wonderful! I wish I could touch them off the screen. Bet they look and feel more incredible in person. Yes, I would like to know that my yarn stash is safe as well :) Cute Happy Girls. You have been spoiled! Lucky you! Hello, what lovely items! You have a great blog and shop too. What a lovely collection of items she does.